Co-Artistic director of SoundBoxed from 2013-2016. Immersive rave theatre, original multidisciplinary devised performances. I started this company with graduates from Rose Bruford school of theatre and performance. Together we made three process based performances. Uploaded by SOUNDBOXED COLLECTIVE on 2016-02-07. 'The Resolution Studio' For Battersea Arts Centre with Will Dickie. DJ Always Will and Jeremiah Isaacs, 2014. 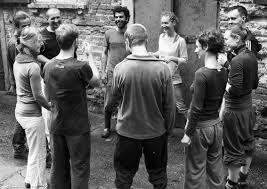 Member of International physical and vocal theatre ensemble Theatre ZAR from 2011-2013 [Grotowski Institute, Wroclaw poland].